For months Palestinian terrorists have been wreaking havoc in the streets of Israel, murdering Jewish grandmothers getting onto buses, mothers in their homes and have even stabbed and killed pregnant women. In March, West Point graduate and Iraq and Afghanistan war veteran Taylor Force was murdered by a Palestinian terrorist while on a post service trip in the country. The Union of Agricultural Work Committees planted the trees to honor men and women who have died while committing numerous stabbings, shootings and vehicular attacks that have killed 34 and wounded more than 400 Israelis since they began in September. The event marked the 40th anniversary of “Land Day,” a Palestinian holiday marking protests of Israel’s decision to take land in Galilee for settlements. 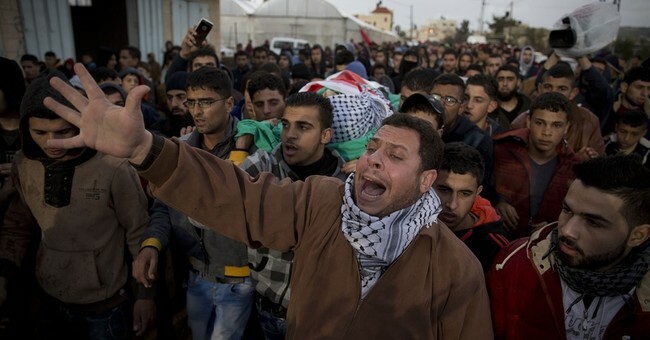 “Through this event, we want to convey the message that we will hold on to the land, and that we will not forget the martyrs who sacrificed [their lives],” said a spokesman for the committee, Aghsan Barghouti, according to a translation provided by Palestinian Media Watch. In February, Arab members of the Israeli Knesset expressed sympathy and consolation for Palestinian terrorists shot and killed by Israeli police and military forces. They even visited their families in the West Bank to show support. On another note, two weeks ago the UN condemned Israel as the world's worst violator of women's rights. It was the only report that focused on any specific country, and seemed to focus largely on the Palestinian issue, occasionally tying it in with gender-related issues, for example unemployment, which was the main complaint sounded by the report. It is worth noting that according to a 2014 World Economic Forum report, Israel ranked 57th out 137 for female political empowerment; the US ranked 54th and Saudi Arabia ranked 117th. Some 27 of Israel's 120 Knesset members are women.